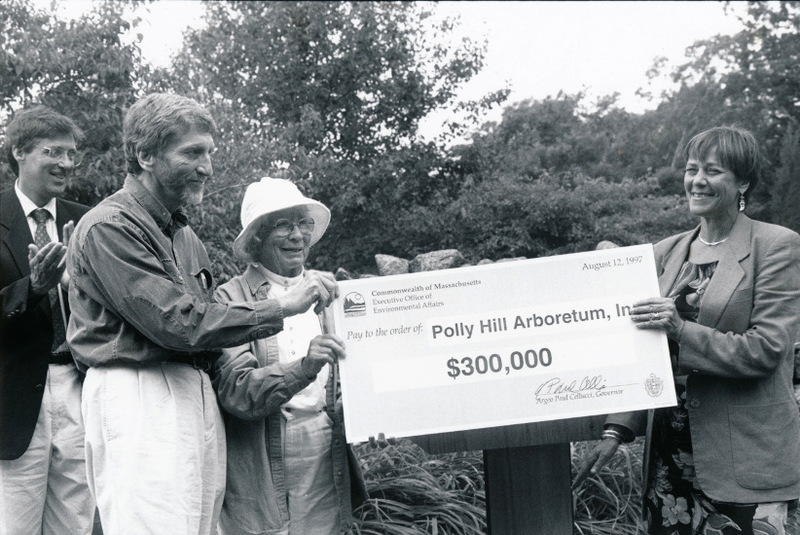 Dr. David Smith, Polly Hill and Trudy Coxe hold the state's check. Photo by Mark Alan Lovewell. The state participated in the preservation of the 60-acre property to insure that it is never developed. Contributors provided the remainder of the $1.8 million acquisition price. “I can’t tell you how important this land acquisition is, how important Polly Hill is to the community, not just as a horticulturist but in terms of setting an example to other landowners,” said Miss Coxe. “This is part of an overall strategic plan on the Island in this area. “It is true Massachusetts has one of the better land acquisition and protection programs anywhere in the country,” she said. After praising the outcome of this land acquisition, state Department of Environmental Management commissioner Peter C. Webber said there are huge trees growing on the property which are rare for the area -- these include hollies, magnolias, rhododendrons and stewartia. He said there are 75 New England champion trees, a pleasant surprise to state foresters who have researched the property. Mrs. Hill will retain a life estate in the property and will continue to do her work with the assistance of the Winter Garden staff. The Arnold Arboretum of Harvard University will use the site as a working laboratory for primary schoolchildren. Public access will be provided. Miss Coxe presented Mrs. Hill with a pewter plate to be engraved later. Miss Coxe said the special plate with a Massachusetts seal is given to friends of the state, an expression of appreciation for her 50 years of work. “We adore you,” said the environmental affairs secretary.